They returned to America in 1801 to join a travelling circus, criss-crossing the greater part of the United States. Potter was able to travel safely in the South as Rannie’s assistant as he was perceived to be Rannie’s servant. In 1806 they introduced live drama into their show where both of them played the leading parts and for which they hired amateur actors for the lesser roles. The following year, the show travelled to Boston where Rannie eventually retired after a few years. He returned to Scotland, leaving Richard Potter to go at it alone as a solo magician ventriloquist. It was here that Potter became a member of the First African Masonic Lodge. His show became an instant hit and he would earn as much as $250 a day (equivalent to $3000 in today’s money). He performed his first show on November 2nd 1811 at the Columbian Museum where he was to appear many times. His self-styled flier read “An evening’s brush to sweep away dull care, or a merry melody to please.” His programme included performing magic tricks with playing cards, breaking borrowed watches and then restoring them, frying eggs in a gentleman’s beaver top hat, dancing on eggs without breaking them, passing coins through the table, passing a hot iron over his tongue, and placing his hand in a bowl of molten lead. He concluded with Trouble Wit (the art of paper folding) shadow puppets and he threw his voice using bird song. This was known as distance voice ventriloquism. He was later to introduce knife throwing into his act, and he would also climb into an oven while meat was being cooked and he would come out unscathed. 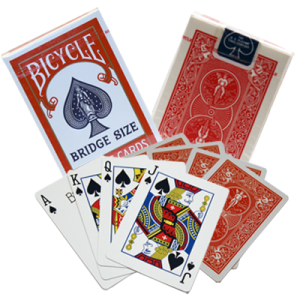 He was said to be a clever sleight-of-hand prestidigitator. NOTE: Placing the hand into a ladle of molten lead is known as the Leidenfrost Effect which is based on a scientific principle but should on no account be tried at home. Legend has it that Richard Potter was said to have performed an outdoor version of the Hindu Rope Trick. It was reported that he and his wife would throw a rope or ball of yarn into the air, then both would climb the rope and vanish. A passing stranger, when he came upon a crowd gazing upwards, asked what they were doing. Being told that Potter and his wife Sally had vanished after climbing the rope, the stranger stated that he had passed them on the road some miles back. Another legend is that Potter could crawl through a solid wooden log, although no details exist on how he accomplished this. Legend can often boost one’s fame. In 1810 Richard met and married a young Penobscot Indian woman, and together they had three children and she assisted him with the show. They performed in New England, Canada and New York, even venturing to the Deep South. Magic acts performed by Asians and Africans were very successful because of the lingering belief of the public in “real magic” from mystical and exotic parts of the earth. 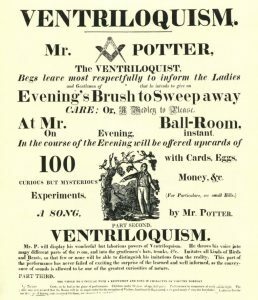 Potter, the consummate showman, took advantage of these folk beliefs and gave his audiences what they wanted—mystery, exoticism and a really good show. In 1817, during the depression of 1815–20, he was confident enough to increase his admission to a dollar, at a time when an unskilled laborer earned about fifty cents per day! Richard with his mulatto coloring often performed with a turban, passing as a Hindu or a West Indian which added to his mystique, and he was often referred to as the “Black Yankee.” Once in Mobile, Alabama, he and Sally were refused lodging at an inn due to prejudice among locals, so they left with their takings of $4,800 (or $5,5000 in today’s money) for their next venue via a different route. 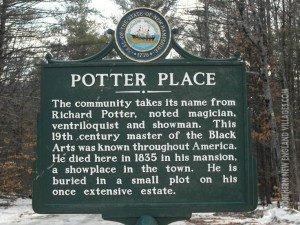 In 1814, as a result of his financial success, Richard Potter purchased a 175-acre farm in Andover, New Hampshire where he built a lavish mansion and entertained regular guests. Once during dinner, his guests complained about alcohol being served, so Richard broke a bottle and produced a chicken, and with his vent skill made the chicken ‘speak.’ His guests soon left bewildered and amazed. Richard Potter named his farm and home ‘Potter Place’ and the name is retained to this day, as is the quaint train station. The International Brotherhood of Magicians Ring 166 in Manchester, New Hampshire is known as ‘The Black Richard Ring’ in his remembrance. Towards the end of his career, Richard Potter put aside his magic in preference for ventriloquism at which he had great skill. 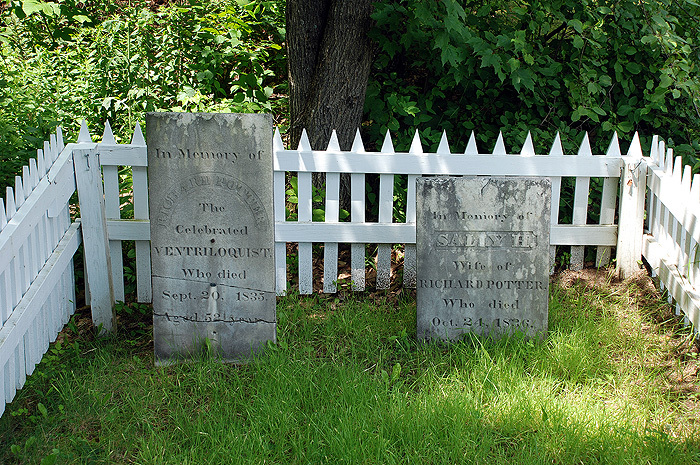 He died on September 20th 1835 at age 52. Strangely enough, in keeping with his life and eccentricity, Potter requested that he be buried in a standing position. His wishes were granted and he was buried upright. He and Sally lie buried in a small plot in what was once the Potter Place Estate. As a testament to his fame and reputation as the first native-born American magician and ventriloquist, his small town was named after him. It was a national tribute to a wonderful performer and an important figure in the history of magic.